October arrives and with the cool weather, you feel the urge to go North as the birds are flying South. 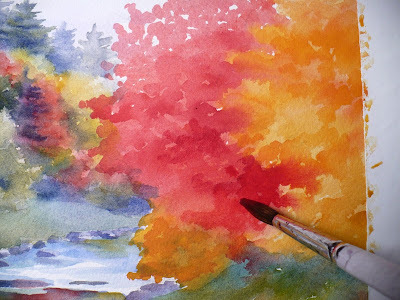 Fall beckons you to places far from the maddening swirl of everyday life where the only sound is a brook running along a stony bed, the only sight a wild landscape alive with the glorious hues of Autumn. I'll show you how I painted this scene. 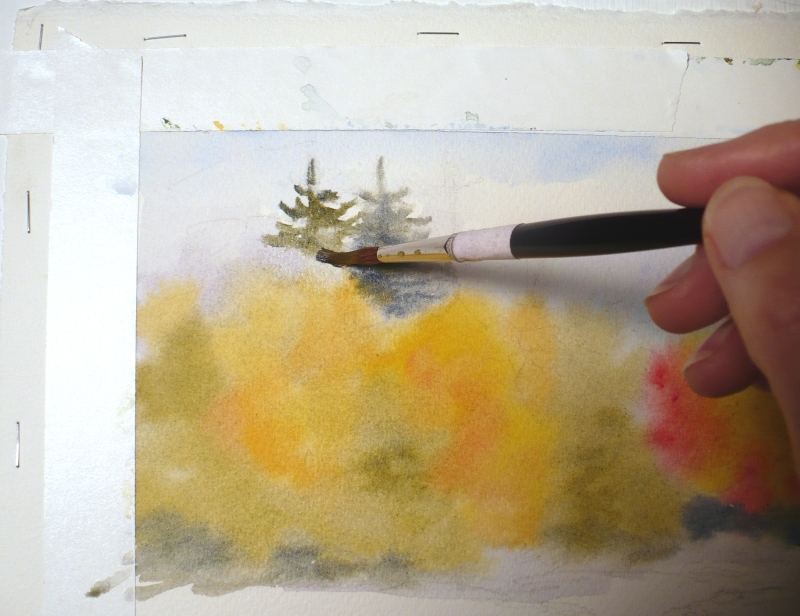 It took me three tries to get this painting just the way I want it - fresh, spontaneous and impressionistic. One never stops learning as an artist! 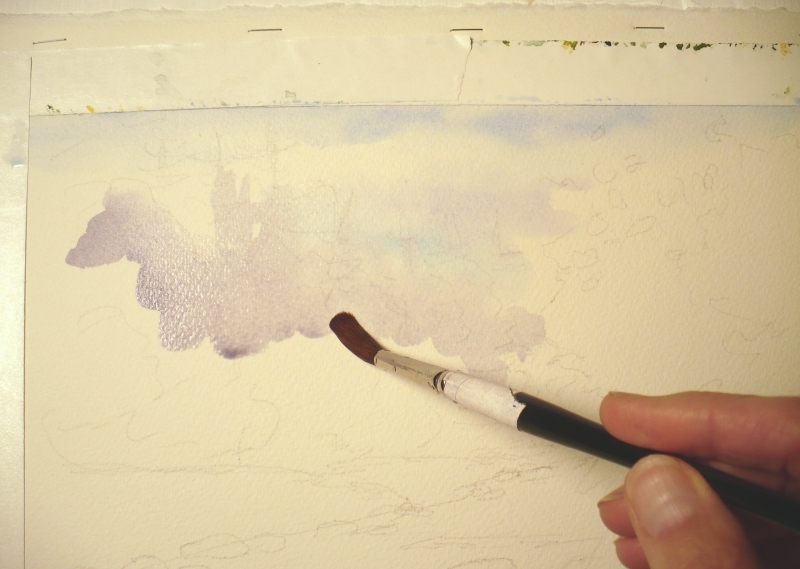 To begin this piece, I start off with the sky, then a wash of gray over the entire opposite shoreline. This will gray down the area that is farther away giving it some perspective. I will paint much of this piece with a wet-into-wet technique. You can click the images to see them larger. OK, so now I just add some autumn color straight into the wet gray! Can you see how the colors are a bit muted? 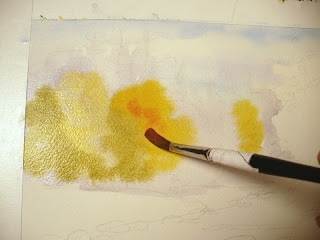 The gray mixes with them on the paper to achieve that effect. This saves time trying to get the exact right colors mixed. 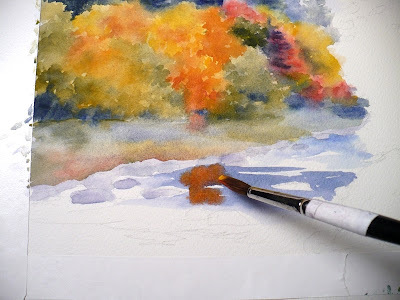 In fact most of my colors will mix directly on the paper. 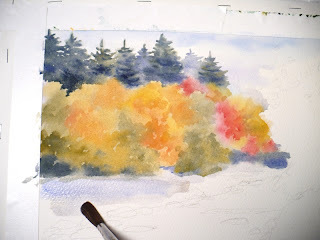 Using another wet-into-wet technique that I like, I paint the background conifers. For this, I paint the trees one at a time with clear water, then drop in yellow and blue. Everything mixes and look lovely. Later I can add some darker values where needed. So now that is done, I repeat the gray process on the slope leading to the stream: gray first, then colors dropped into it. 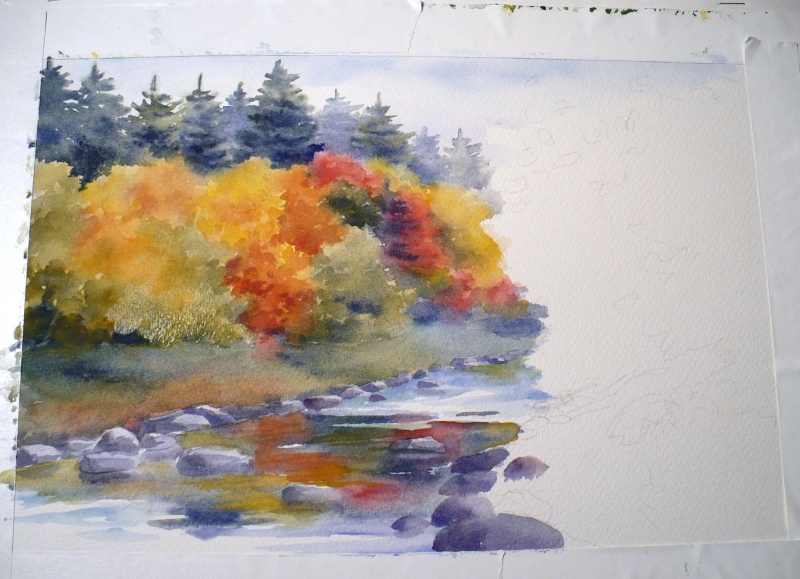 Now I added some rocks in the stream and am going back to add more value, shadows and a bit of detail to the trees. Not much because I don't want this painting to be detailed. Now for the stream. As you can guess, wet-into-wet! First blue-ish gray then drop in colors to denote reflections. It helps to make sure the reflections are directly under what is being reflected, but detail is not necessary here. Here is the painting so far. At this point, I can tell that, unlike its two predecessors, this one will be successful! 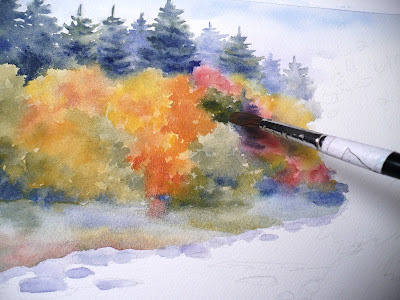 All that is left to do are the colorful trees and slope on the right. So I paint in reds and yellows and add more values and bits of detail here and there. And voila! Here is the painting completed. Hope you enjoyed the demonstration! 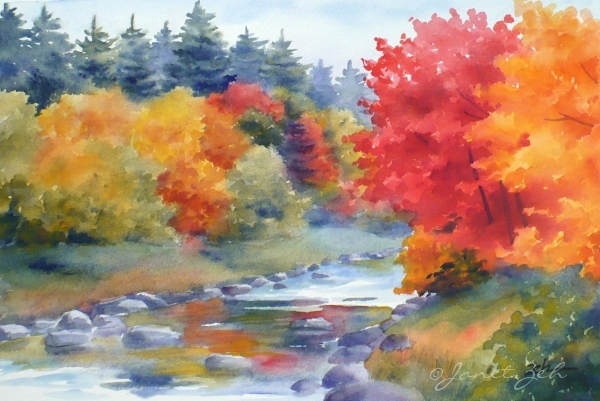 You can find a print similar to this painting in my print shop here: Autumn Glory fine art print.